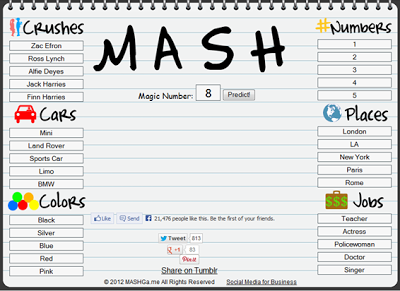 Remember that game that everyone used to constantly play at primary school that 'predicted your future' - M.A.S.H? I used to absolutely love that game and would spend most of my lunch times and break times sitting on the school field with my friends playing it! Recently i was checking out lots of new blogs that i'd found on Zoella's facebook post about advertising blogs and youtubers (this one) and i discovered Nicole's blog (it's fab - check it out)! She's done a post about playing M.A.S.H online and i had nothing to do today at a family BBQ so i decided to give it a go! I'm really happy with the results - if this actually happens i'll be a very lucky girl (except for the shack part of course, but you never know it could be a glamorous shack?). 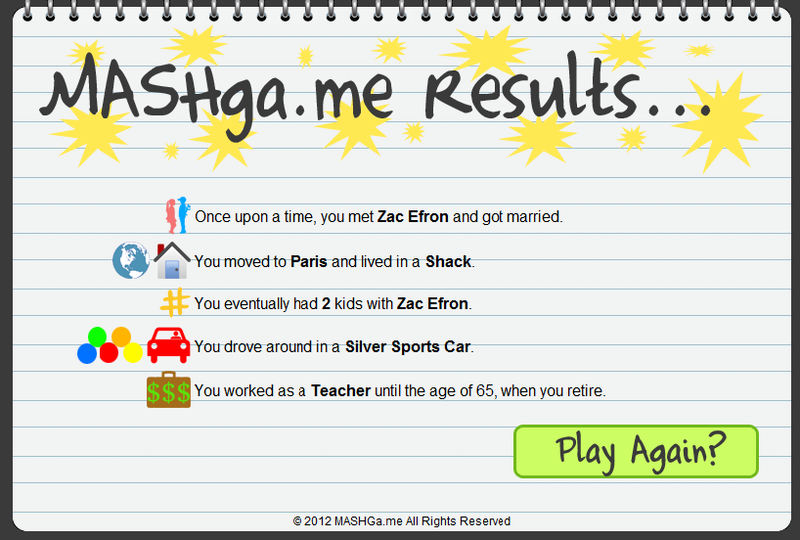 So if you fancy 'predicting your future' online this is the website. If you do it, why not make a blog post about it and spread the M.A.S.H love! I think your results were a lot better than mine when I played M.A.S.H! Thank you so much for the mention by the way! Your blog is amazing!